I can't believe I sewed in ALL the ends on my Babette blanket this week. Yay, I'm such a good girl sometimes! And what a relieve to get it over and done with too. I also would like to thank you for all the lovely suggestions I got on the use of the border color last week. Kylie suggested to be a rebel and not use a border at all. Even though I AM a rebel on many things, I do like a border somehow. Still I couldn't make up my mind so I decided to do some quick samples to show you. Turquoise and (soft) green were two suggestions that were mentioned most. I also liked the idea of a red border somehow. 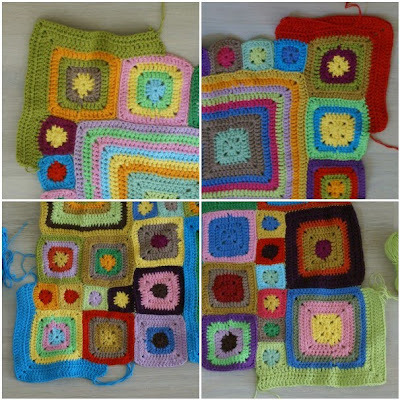 I remember that in the very beginning of my blanket I found the red kind of harsh and then someone mentioned in the comments that it would look really good on the blanket in the end. I didn't believe her right away, but I certainly do now. Thank you to whoever convinced me not to leave the red out. Here is the blanket with 4 different corner colors. A close up of the corners. Some suggested to use black or cream/white. Difficult choice huh? Psst... the yarn for my new project arrived too! Wanna see?